However, because so many people are using Twitter and so many create their own hashtags to follow along with the conversations, there is sometimes some confusion about what hashtag we should be using. 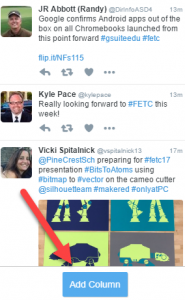 The official hashtag for FETC is #FETC but you’ll find that many people are tweeting about the conference and sessions using #FETC17 or #FETC2017. So, how do we ensure that we don’t miss a thing? 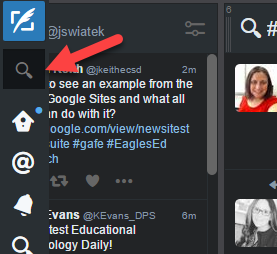 That’s where Tweetdeck comes in really handy. window. This handy little tip will help to ensure you do not miss out on anything at the conference this week. Keep in mind though, #FETC is the official hashtag for the conference so be sure to keep an eye on that and follow @FETC for all official announcements during the show. Have fun!